Whether you are trying to rank for specific keywords or come up first in a local search, SEO is critical to your success online. Understanding it, however, is not so easy. With Google releasing regular algorithm updates even local businesses that have had some success can easily find that they have lost their spot overnight or that a competitor has squeezed them off of the first page of search results. We help business owners and marketing teams to make sense of this every day and have found that it helps to understand what the current critical components of SEO are. •	Direct Answers. Search engines are crawling pages to provide users with direct answers to their queries. While users can get the information that they need without actually visiting your website, you can still receive traffic this way since many users will click to learn more. •	HTTPS. If you have a secure site, you will receive an SEO ranking boost, according to Google. •	Mobile-Friendly. Google’s latest algorithm change was focused around improving the user experience for those using a smartphone or tablet. Your website should be either responsive or mobile-friendly to ensure that it is easy to read and navigate in addition to loading quickly. If you still have a standard website, you could drop in the search results. •	User Engagement. This is more important than ever for SEO and includes social shares, comments, etc. It will also lead to increased traffic as users share your blog post or website with their friends. Creating compelling and interesting content will help to improve your engagement levels over time. •	Headers. Incorporate your essential keywords into your headers when optimizing your website for SEO. •	Local SEO. With the increase in user demand for immediate information and search results in their local vicinity, local SEO matters more than ever before. Make sure that your name, address, and phone number (NAP) are listed correctly on your website and business listings so that you can take advantage of this growing trend. •	Speed. This is particularly important in a mobile search. Your website needs to load quickly or people will abandon it, limiting your opportunity to acquire a new customer and ultimately hurting your SEO. •	Structured Data. This allows search engines to crawl your website to determine what information it contains and which information is the most important. If you have not addressed this yet, we recommend working with an SEO professional that is skilled in web design (like us) since structure data is added to your webpage’s HTLM markup. •	Content. Fresh and original content is going to continue to be important in SEO. Avoid keyword stuffing or plagiarizing content since this can lead to your site being penalized. There are specific ways to incorporate your keywords into blogs and page content that makes the content appear natural and useful, two things that will help to improve your SEO. 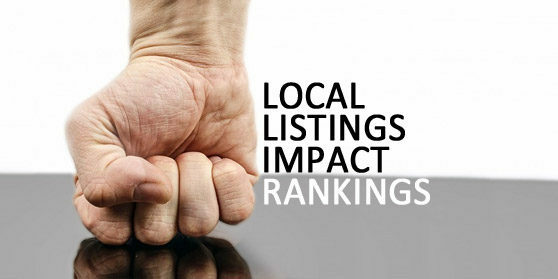 These are only a few of the factors that can influence your ranking in a local search. To learn more or to have your website audited, give us a call.